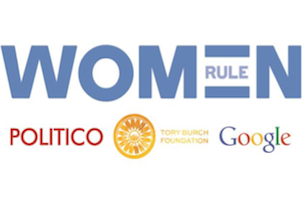 POLITICO, in partnership with Google and the Tory Burch Foundation, announced earlier today their 2014 plans for Women Rule. This year the event series will expand to New York City and San Francisco, as well as continuing to host events in DC. Women Rule launched in 2013, convening hundreds of women leaders to share expertise and insights. The yearlong series will “examine how women are leveraging their power to create change in policy, politics, boardrooms, and their communities.” The 2014 series will kick off in late March in DC with “How Women Run: Power, Perception and Reality,” an event looking at women in roles ranging from the campaign trail to the Hollywood screen. Women Rule 2013 featured Dr. Jill Biden; Cosmopolitan editor Joanna Coles; Sen. Kirsten Gillibrand; FEED CEO Lauren Bush Lauren; Samantha Power, U.S. ambassador to the United Nations; House Democratic Leader Nancy Pelosi; Fox News’ Greta Van Susteren; and PBS’ Judy Woodruff. For information or to get involved, email womenrule@politico.com.